31 courses and activities are being offered in 2017. To find out more about a particular group, click on Groups on the menu at the top of the page. There are no prerequisites or exams! The newsletter deadline is the third Wednesday of the month at midday. Our monthly newsletter will be posted or emailed at the end of that week. The website's home page, group pages, and daily calendar & monthly calendar are updated at this time. Newsletter items for June are to be forwarded by midday on Wednesday 21st June to http://newsletter@u3abenalla.com. 'Legal Matters' This popular short course of 2 two hour sessions on Wills, Powers of Attorney and Online Banking is being offered by retired lawyer John Barry during Semester II. For course details see the Legal Matters page on this website. The anticipation is building for our move to the Seniors Building, between the Library and the Fire Station, in Fawkner Drive. A meeting will be held at 10 am on Wednesday 5th July in our new meeting room and it is essential that all convenors attend. If a convenor is unable to attend please arrange for one of your group to be at the meeting. This will enable all groups to know the layout and facilities of the new venue. Convenors please let me know, by phone or e-mail who will be attending. U3A will be entering and exiting the building using the side door near the small carpark. This is to prevent disrupting members of the Senior Citizens in their activities. We have a few items in W4, such as the steel cupboard with the broken lock, TV stand, etc., that will not be going to the new building. Some items are free and others have a small cost attached. If anybody is interested in this please call me on 0412 263 071. I am very pleased to announce that we have 247 members. If we reach 250 it will be the first time in the history of U3A Benalla that we have had so many members. This will be cause for celebration. 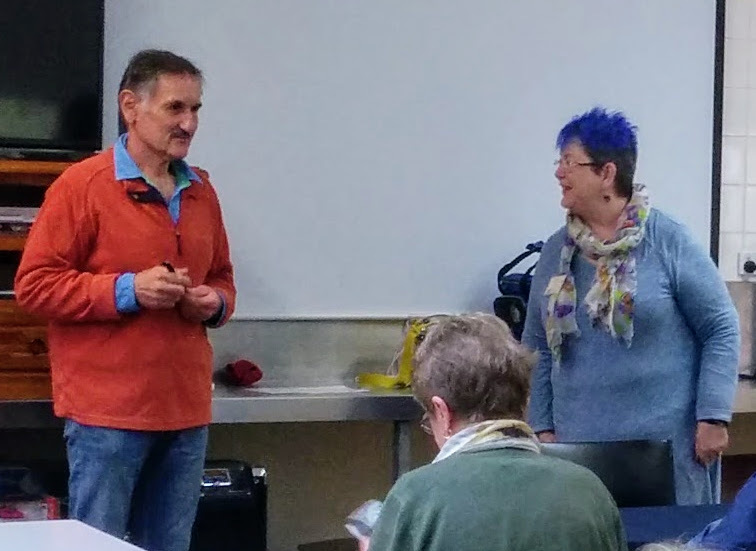 Meet and Mingle - President Dorothy Webber thanking guest speaker Jim Myconos from the Benalla Street Art Festival. Ian Burkinshaw Longtime U3A member, Ian Burkinshaw passed away last week on the eve of his 92 Birthday. Ian was convenor of the Cycling Group and a member of Investment 1 group for many years. Ian attended Writing Workshop last year and presented a number of stories. 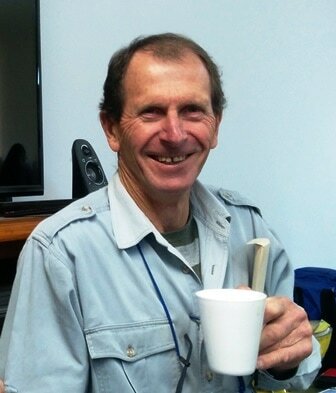 Ian's funeral will be held at 11am Tuesday 30 May, Uniting Church, Benalla.